Incoming freshman, foreign-born students, and anyone living in University housing, two (2) doses of the MMR vaccine are required. All other students, one (1) dose of the MMR vaccine is required. In accordance with the Arkansas State Board of Health Rules and Regulations (Section III C2), proof of 1 of the following must be provided within 30 calendar days after enrollment. “Acceptable proof of immunization” is an official immunization record from another educational institution in Arkansas, a licensed medical doctor, or an authorized public health representative, or military service. In lieu of receiving the vaccine, immunity can be shown by providing documented evidence (such as a letter from the Arkansas Department of Health approving serology as proof of immunity) or appropriate serological testing. Proof that the student has applied for or received a medical or non-medical exemption (waiver) for those vaccines he/she has not received will be accepted in lieu of receiving vaccine. Proof that the student was born prior to January 1, 1957, will be accepted in lieu of receiving vaccine. Incoming freshman or foreign-born students may temporarily be admitted to UCA who are in the process of receiving the required two (2) doses of MMR vaccine. “In the process” means the student has received at least one dose of the required immunizations and is waiting the minimum time interval to receive the additional dose. When a student is admitted who is in the process of completing the required minimum immunizations, the student must complete the required dose on schedule. For undergraduate students, the admissions office will collect the immunization documentation for incoming students and will indicate in Banner whether the student is properly immunized or not. The admissions office will then send a hard copy of the immunization record for each incoming student to the Student Health Clinic (SHC). The SHC will enter the students’ immunization status in the EMR and will scan in a hard copy of the immunization records/or waiver. 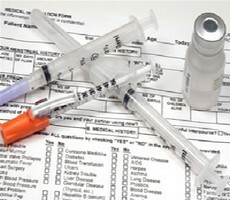 The SHC will compile a list of students with incomplete immunization documentation at the beginning of each semester. The SHC will e-mail the students at least once requesting their immunization records. If after 30 days, any student has not provided the proper documentation or has not received the appropriate vaccination in lieu of providing the proper records, this list of students will be forwarded to the Dean of Students for further action. The following are immunizations for incoming college students RECOMMENDED by the Centers for Disease Control (CDC), the American College Health Association (ACHA), and UCA but NOT REQUIRED. Vaccine-preventable diseases continue to occur on American campuses and this can be a good time to update any immunizations to help prevent these diseases. For more detailed information on all Immunizations/Vaccines click here! !